Email remains the number one converting channel for most B2B marketers. You’ve worked hard to get that data, maintain it and ensure it aligns with GDPR requirements, so getting those all-important contacts to open an email is critical if you’re going to hit your numbers. Assuming that you’ve got a great campaign idea, the data is clean and you’ve segmented well, your next focus should be on your email subject lines. The number of opens in your B2B campaign will directly affect the number of conversions you get. Whilst obvious – and very important – how much time do you spend crafting those few vital words? In B2B, we’re more set on the interaction that helps people to hand raise or increase their score a teeny, tiny bit. That sale is way off, but the more we can tip over to the state of ‘active contact’, the better, right? Shorter the better. If you can make it work with three words, great, but definitely no more than 7. It won’t be seen on mobile and it could be cut off in some mail systems too. Don’t be afraid to put 500 people in an A/B subject line test. Knowing how 250 people within your segment behave is great insight. And if one of the subject lines greatly outperforms then you’re laughing. 0.5% difference on 10,000 names is an additional 500 people that will read your email. Every person counts. Be sensible on the split test though and figure out what makes a reliable result with your volume of data. 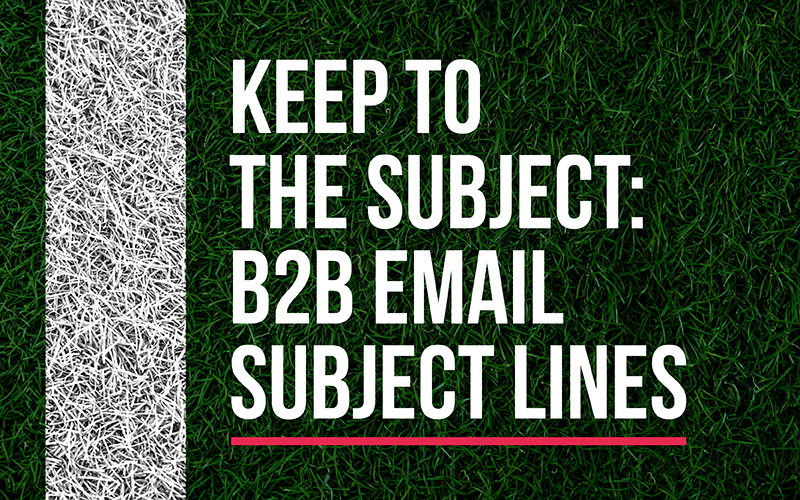 There’s no harm in personalising your B2B email subject line. It doesn’t just have to be their name, you could use the company name as well, or some other ingenious field within your database. Don’t abuse this though – be selective. It’s easy to state the obvious, but what’s the value to them? What will they get out of reading the email – and it’s not the asset you’re likely to be promoting, it’s the information contained in it that is the value. • Our latest whitepaper on ECM! Questions work well. They entice and create intrigue, so consider how you could use them. Not my personal favourite, but in the right context, might be worth try – depending on the topic, type of business you are, or the campaign your running. I’m a sucker for these. They’re a trick by insinuating that there’s already a relationship in place, and I fall for them! Sometimes I feel cheated, but sometimes I go on and click. It’s your call whether you use them, but again, only do so selectively. In the list of subject lines above, can you see the difference between those that use an active verb and those that don’t. It creates a sense of urgency and action. Statistics create intrigue and can capture attention. It’s worth trying them out – particularly if they’re credible and highly targeted. A fairly obvious one, but if you’ve got an offer or promotion on, lead with it. Enough said. We don’t have to be dull with subject lines. Get a few people together and spark ideas on how you can push up the open rates. Freshen up your language and try some of the techniques above.